Avoiding a roof replacement is the goal of nearly every home owner. While replacing a roof is expensive and inconvenient, there are numerous things that threaten the integrity of your roof and can inhibit serious damage. Being aware of these threats will help you protect and keep an eye out for what you may be able to fix before your roof is broken. One of the most common threats to a roof, commercial or home, are trees. 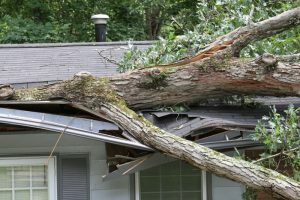 If there are large limbs reaching out over your home or business, all it takes is one storm, an aging tree, or just enough weight to cause it to snap. Ensuring the trees limbs are trimmed back allows your roof protection from a limb falling and causing issues. If a limb does break and falls on a roof, remove it immediately and check other potential hazards of it reoccurring. Some of nature’s cutest animals provide the largest hazard to your roof. A few of the culprits are raccoons, woodpeckers, squirrels, or nesting birds. While raccoons have been known to tear off shingles or a vent cover in search for shelter, woodpeckers can rip off shingles in search for insects. Or if your tiles and sheeting are not secure, nesting birds and other small animals have been known to make nests under the roofing. While many of these issues are hard to prevent, it helps to have frequent inspections of your roof to ensure you’re not being invaded by unwelcome creatures. Ah yes, the common culprit. Weather has been known to cause damage to roofs quite often, or at least play a part. 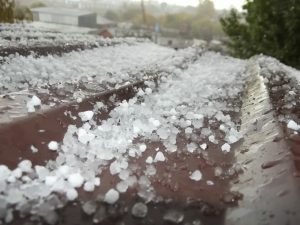 Hail and high wind are usually the cause for roof damage. If your roof is exposed to consistent winds, it can deteriorate your roof over time. On asphalt or tiled roofs, hail can cause holes or even crack and break the tiles. Always have your roof inspected after a hailstorm. If there is damage done and is not repaired, moisture will collect and can cause further damage, resulting in a larger cost for you. Regardless of the potential causes of roof damage, you should always have your roof inspected on a regular basis. At A&H Forensic Roofing, we offer free inspections and will help identify any issues hazardous to your home or workplace. We believe in doing the best job, the first time. Don’t wait until it’s too late to take action, click or call our roofing contractors today! And for those emergency situations, contact our 24/7 Emergency team. We have teams to send out at any time to make sure you’re covered!